Nestled on the slopes of Mt. 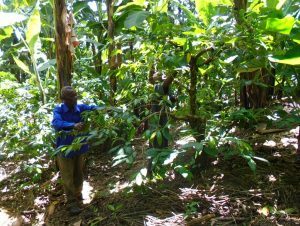 Kilimanjaro, Africa’s highest peak, roughly 700 farmers from the Mrao and Momwe villages are produce Bourbon and Kent varieties for our Tanzania Peaberry Mrao as members of the Mrao Cooperative. In the cup this Tanzania Peaberry Mrao has a medium body and is very bright, even zesty with some fruity overtones. Each farm is an average of ¾ acres in size, effectively maintaining small-scale production as a means to achieving the highest quality. The Mrao Co-op farmers produce Bourbon and Kent varietals and share an average altitude of about 1300m. This Tanzania Peaberry Mrao is a 100% peaberry, washed, hand pulped and sun dried coffee. Harvest runs from April through December, varying with respect to each farm’s elevation. The Mrao Co-op is based in the Rombo district on Tanzania’s Northeastern border with Kenya, and is part of the Kilimanjaro Native Cooperative Union (KNCU). The Mrao Co-op was founded in 1954 but did not register as a KNCU member until 1987. At present the Mrao Co-op produces around 80 tons of specialty coffee each year. Like the Keryo Co-op, Mrao plans to join the UTZ program in 2016. The KNCU was first established in 1933 with the passage of the nation’s Cooperative Societies Ordinance. Initially the union claimed only 11 sub-member affiliated groups, but today it has grown to serve over 90 affiliates with over 70,000 individual members. The KNCU has been a certified member of the Fair-Trade organization since 1993 and provides a number of services to its membership, including provision of farming equipment, arabica seedlings and fertilizers as well as market pricing information services and training in sustainable methods of agriculture. The KNCU also provides for collection, transportation, grading, processing and packaging of its members’ coffee in addition to a wider range of community initiatives such as educational funding, health care services, an ecotourism program and a farmer’s savings bank for loan access and crop financing. Cupping Notes: Medium body, good acidity, zesty. Very bright cup with fruity overtones.